Do you want to get more done? We all do. If you are going to get things done, you have got to learn this secret. Get things done through other people. It is the old term of delegating. If you are a pastor and your running a ministry, if you are a coach and your running a team or a sports league; if your nonprofit leader running a ministry or organization; if you're in the workforce; if your a manager and you’ve got all kinds of plates you're spinning, there's only one way to get more time. It is to use the time of others. It is to delegate to the right kind of people that can help you get more done. Here's the thing, we have been given 24 hours in a day, and that's it. None of us have 25 hours, none of us have 26 hours in a day, we each have 24 hours in a day. That's the way God created it, so if you want to get more time, you’ve got to learn to use other people’s time. You need to surround yourself with people. You need to build a team of people, and you need to delegate. Why? Because the only way to get things done, get more done, and get it done right in the same amount of time, is to use other people's time. If you're going to be an effective leader, you must learn to be an effective delegator. You've got to learn to find the right people. That's the key; find the right people. Remember when Moses went up on the mountain, and he left his brother Aaron in charge? He delegated, and he thought everything would be just fine. However, when he came back they had built a golden cow, and they were worshiping it. You’ve got to be careful who you delegate to, and make sure your surround yourself with people that you trust, people that are in alignment with your heart and with your mission, and then you get them busy. Not only is this good because it helps you get more done, but if you’re a leader, your job is to develop people. The number one way to develop people is to give them responsibilities. Responsibility goes in phases, however. You start by having them do research and investigate, and you have them report back to you. You give them some job where they report back. Eventually if it's a good person, a good team, people that you can trust entirely and you know they will see through every part of the process, it will become a beautiful thing. 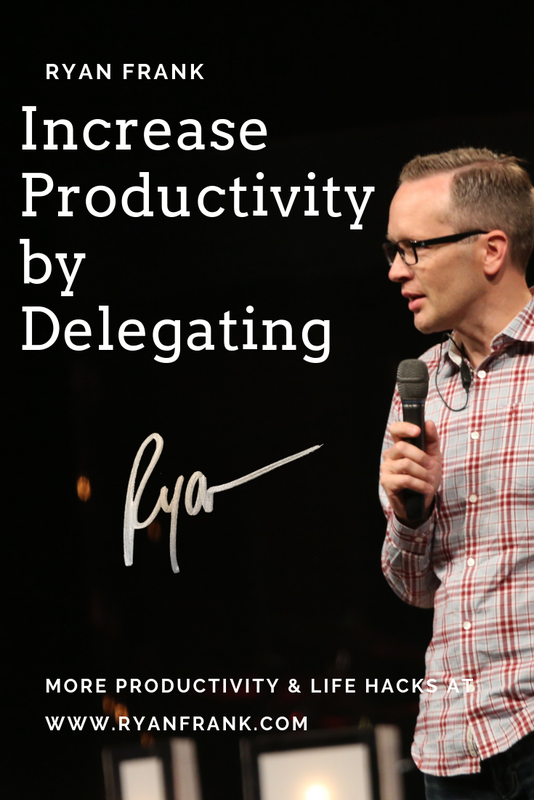 Delegating is the secret to productivity, especially in the life of a busy leader. It allows you to get more done through others, and it allows you to develop the skills of others. Here’s the challenge: way too many of us are perfectionist. We want to do it ourselves because we want to get it done right. Some of us have been burnt in the past. Remember Moses going up on the mountain comes down and Aaron, his brother, has allowed the people and has led them in the building of the golden cow. If you've been hurt in the past, it's hard to delegate because I don't want to get burnt again. Maybe you have your own insecurities or fears or questions, so it’s easier for me to do everything myself. However, you'll eventually burn out. You're going to be a limited in the scope of what you do, and you will not develop others. Do you want your ministry go to a new level? Do you want your organization to go to a new level? What about personally? Are you ready to go to a new level? Start building a team. That team could paid employees, family members, or volunteers; you just need to find good people. You need to invest time in them. You need to assign responsibilities and follow up. If you do that, you can duplicate yourself in others over and over and over again. What it does is it allows you to do the things that only you can do, and it allows other people the ability to do everything else. Are you ready to start delegating? Here’s the frog I want you to eat. Look at your list; look at your to-do list; look at the list of tasks you have to do. What are you doing that someone else could be doing? It's time to find somebody; it's time to invest time into somebody. Start building a team, and give that stuff away. Be a master delegator. You'll thank yourself. Your organization, your church, your business, they will thank you because you'll get more done, and you'll be more effective. You will also build a team, which is what leadership is all about.